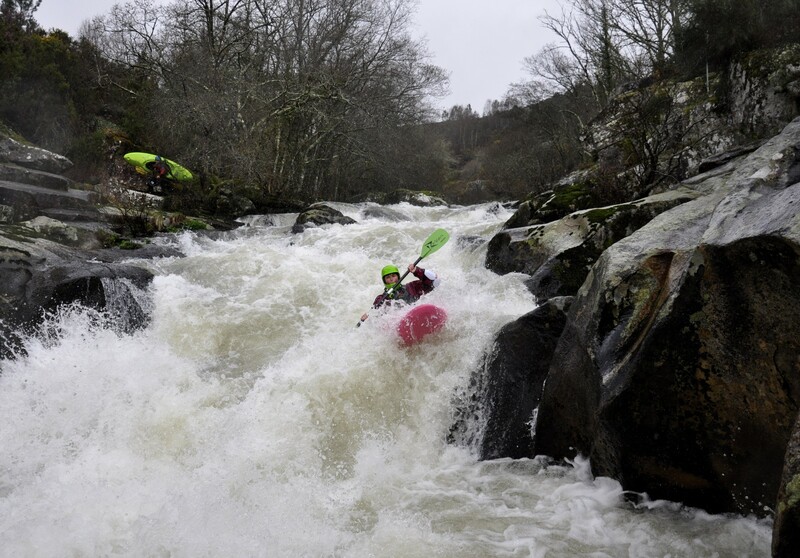 10 days, 8 rivers, 5 different areas – that’s what a successful trip means to me… Add a bit of wind, rain, snow and Chorizo > that’s paddling in Spain. With flights from Geneva to Bilbao being rather cheap, we decided to head off for a spontaneous trip with our friend Txus who planned to leave for a short recognition tour to Galicia to check for commercial trip potential. 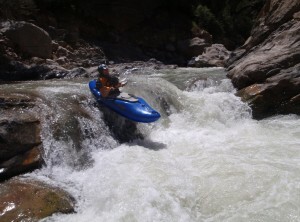 The first four days we spent paddling around Durango, exploring Basque country. Snowmelt was slowly starting and provided nice levels in some of the creeks in the valleys nearby. Ever heard of Aranzazu or Salazar? 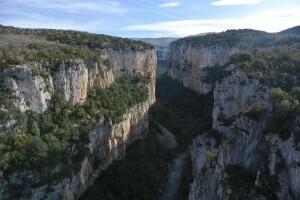 Whilst one offers a 3km staircaselike gorge with very continous action the other one lies hidden in Arbai’un – an almost Verdon like gorge. 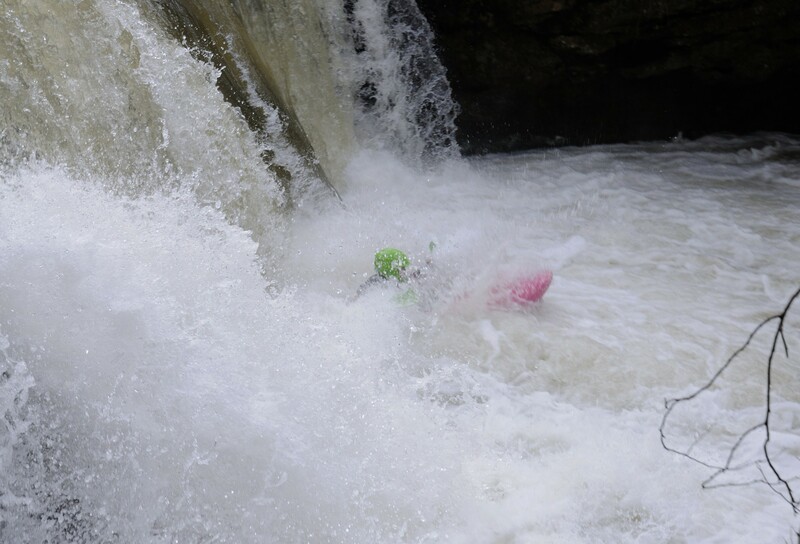 Although the whitewater is not too hard a couple of drops with sticky holes at the end of the ride require a bit of attention. Next stop was the classic run on the Gallego river – ghastly winds and nearly freezing temperatures forced us to finish the run in racepace. Not much time to enjoy the sight of the famous climbing walls of Riglos… This day, hot coffee in Paco’s bar in Murillo was the much better option! We then returned to Durango to set for Galicia. As paddlers are either kayaking, eating or sleeping, we started day 4 by buying all the tasty (and healthy) stuff Spain has to offer: Chorizo, Jamon, Queso, Chips, Chocolates, Cornflakes, Cerveza… Then jammed everything and everyone in the van and off we went. 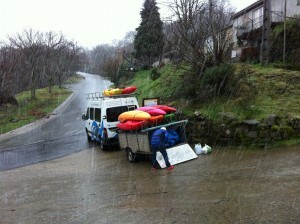 Although we started in the afternoon, we managed to paddle Gandara river in Cantabria. It’s a nice run and definitely worth to do on the fly-by. A late evening lunch on the village’s central place and some hours driving later we spent the night on a parking lot in the middle of the town of Arriondas to paddle Asturia’s Ponga/Sella the next day. 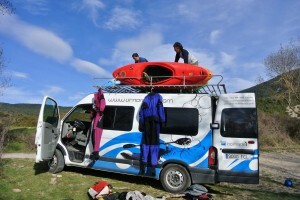 On day 6 we finally arrived in Galicia, ready for some action. 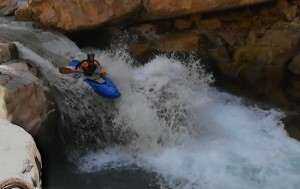 Like Corsica, it’s a whitewater paradise, but it demands his toll. Rivers are not easy to find (and local advices sometimes a bit treacherous), scouting and portaging can be quite a task, and yes – it rains a lot! But it’s worth every bit of cursing and removing thorns from everything. 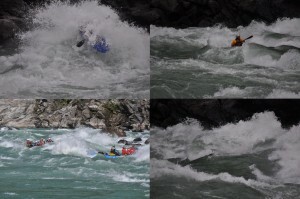 In three days we paddled Upper Ulla, Classic Deza and Parada – three very different rivers in also different valleys. Unfortunately due to really bad weather we were not able to pull over to Portugal to paddle Castro Laboreiro – a good excuse to come back! The five hour drive back to Durango provided some action. 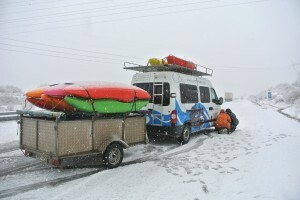 Short, but heavy snowfall near the portuguese border forced us to mount the chains on the highway . Conclusion of the recignition trip: Apart from top creeking Galicia certainly offers great potential for commercial or intermediate trips. 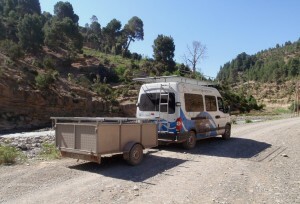 Most of the rivers lie within a 100 kms range, so a basecamp in a rental house makes sense. 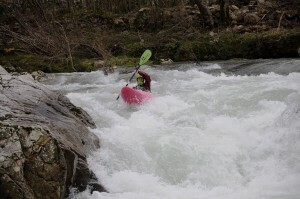 It’s not only a paradise for the creeking maniac, it also has to offer plenty of class 3 and 4 runs for the intermediate paddler who does not care for some rain and thorns… And flights to Santiago are really cheap. For more information check Urnomade's new website for 2014 trips! Last w-e we spent two days of kayaking in the French Jura. Seeing these nice rivers, I can hardly understand why this area is so unknown to most paddlers (incl. me). We ran Bienne and Saine river, which was lots of fun. 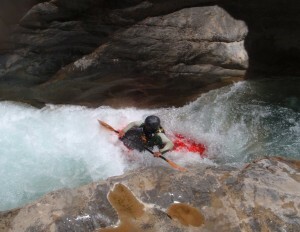 As the levels were not too high we were able to make Saine top to bottom, which by doing so, gets quite a long gorgy run. We’ll be back soon! 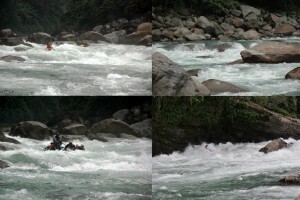 It was early spring last year when we decided that a whitewater trip on the Siang (aka Brahamputra) river might be a good idea. 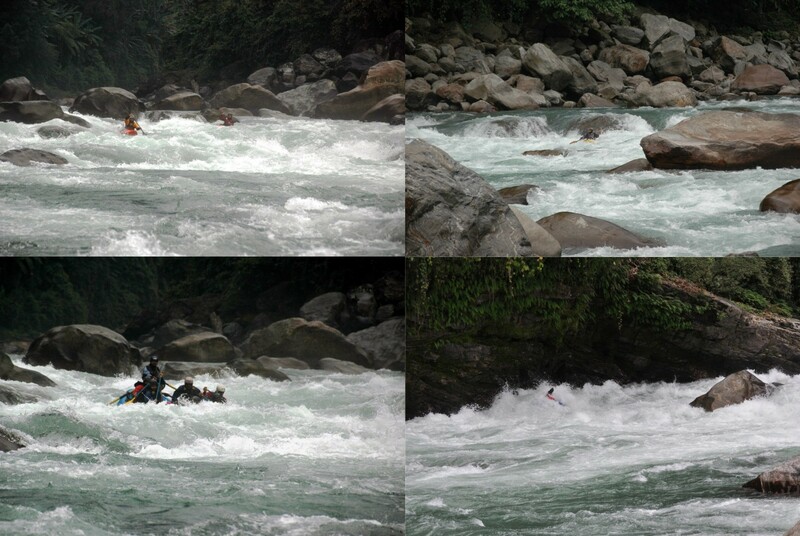 As we had three weeks off, Subansiri, River of Gold, as a second trip sounded like another good idea too. 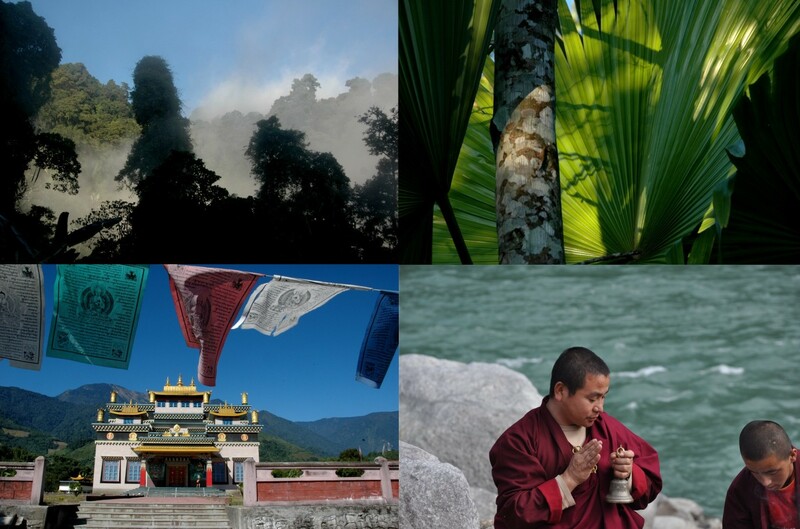 Travelling in Arunachal Pradesh is not meant to be easy. Tourists are few, you need special permits, have to be a group of at least 4 persons, need to be accompagnied by a local guide… So we decided to sort out logistics the lazy way. Very soon we got in contact with Vaibhav from Aquaterra. We found ourselves able to rent kayaks with him, make the two trips in one go and got all the paperwork for the restricted area permits done… And we were with guys who know the area very well, heard a lot about culture we probably wouldn’t if travelling on our own. No need to care for food, transports etc. Simply enjoying one day of kayaking after the other! The two-day drive to the put-in of the Siang is very interesting. You drive through multiple Adi villages whith their nice bamboo sheds and friendly people. The probably only reason for this street going up the Siang valley is the military presence up on the nearby Chinese border. It’s mostly unpaved, crossing small bridges, and sometimes upcoming traffic creates interesting situations… But easy man: blow horn! We spent two 8/9h days for the ~190km drive to Tuting, which maybe gives an impression about the road conditions. 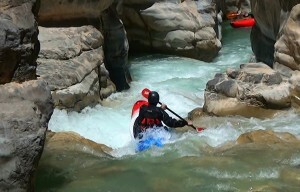 The two of us were the only foreign kayakers, teaming up with Khana Singh, Sanjay jun. and Nagendra providing safety for the rafts. 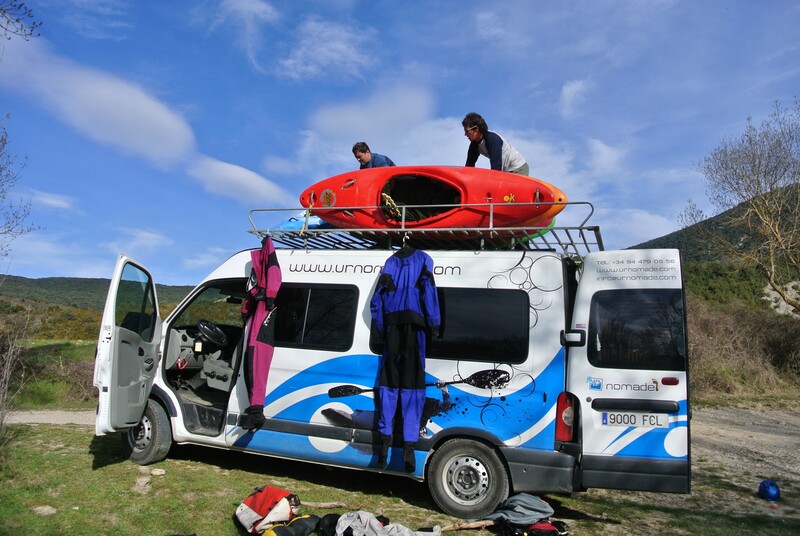 We set the first camp on the shore, next to the famous Ningguin rapid. They don’t run it with rafts any longer, but for us kayakers it looked OK. Water was pretty high, due to late and heavy monsoon rainfalls. No time for warm up or accomodating to the never before paddled kayaks. We carried up und gave it a go. What looked huge from the shore, was even bigger and much faster than it seemed:-) This is big water! The first two days incl. the gorge section contain some pretty big rapids, and at this level boils sometimes became pretty impressive. Day three was rather mellow before things got more serious on day four again. 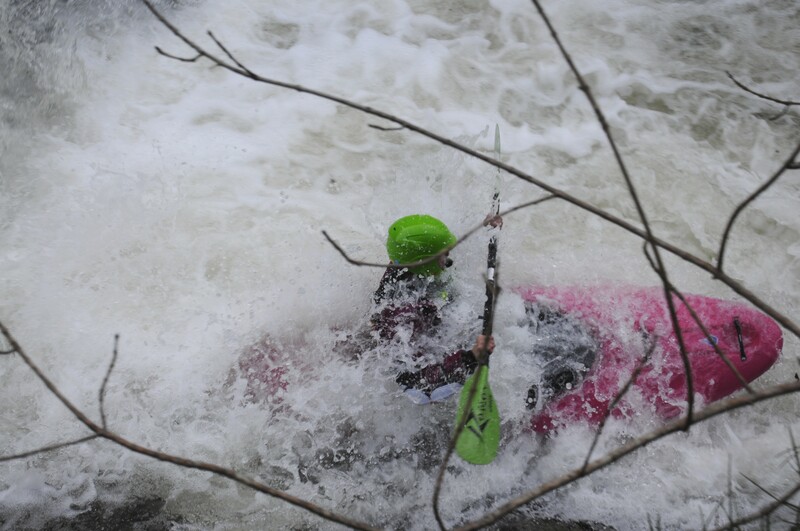 Due to the level Moying Madness, Karko Killer and Kim-Broken-Oars provided some big water action. Serious fun for us kayakers, and luckily none of the rafts flipped. A swim might be devastating, but Rana and Sanjay did a very good job guiding the rafts. At the end of the 7th day we dropped back to Pasighat. The day after we met Vaibhav with the group for the Subansiri, and some more kayaking friends. The drive up took two days as well, but the road is in a much better condition. 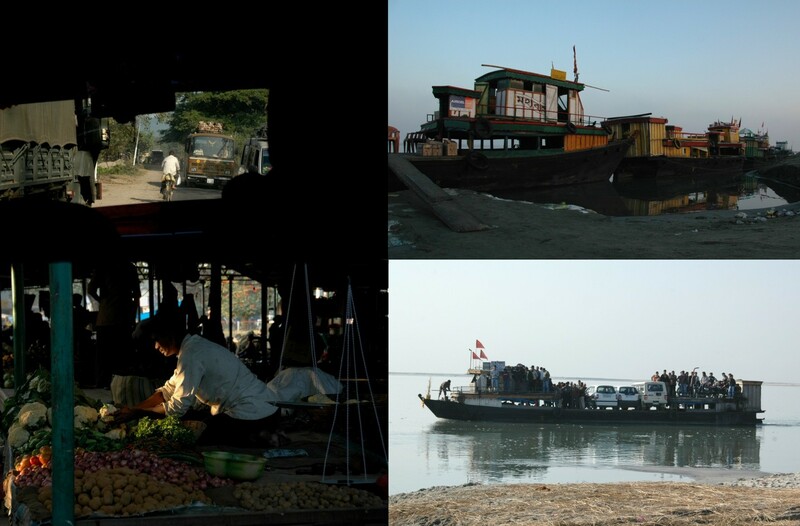 Subansiri was quite different to the Brahamputra and for us the ideal chill-down. 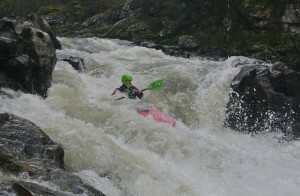 The first two days is some Class 4 action in boulder gardens, with days on the river being rather short. Day four delivers some fun class 3 action in small gorges, before the river enters the lower gorge. 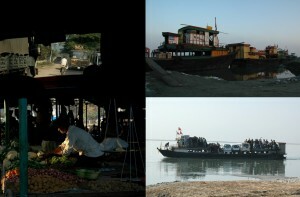 The next three days are completely secluded, exept for some local tribes (mainly fishermen and loggers). Too soon all the fun was over and we had to head back to work! Vaibhav: congrats for your team and it was tons of fun hanging around with you guys! 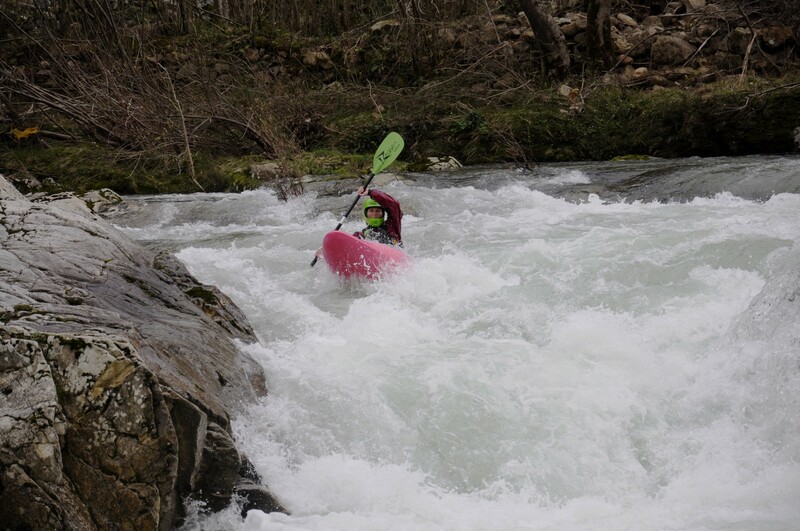 Due to heavy rainfalls the week before, we found nice levels on the Sesia tributaries. 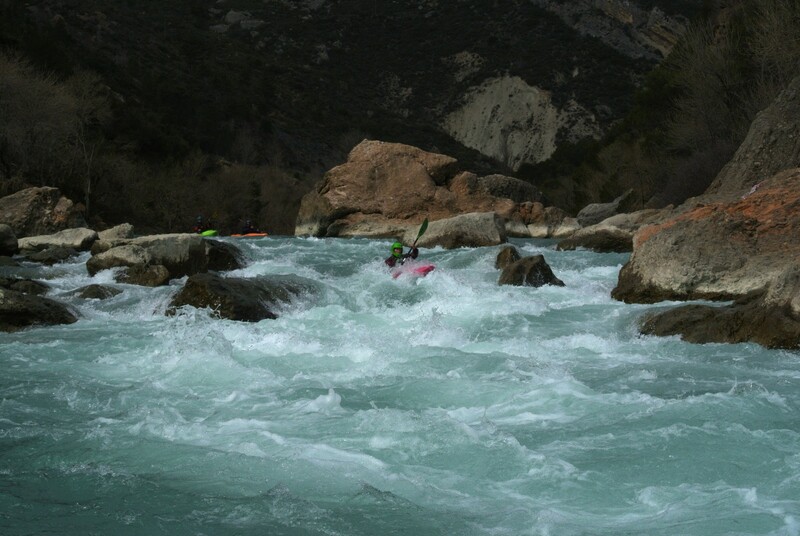 Water was moderate to low, but Egua and Sorba still offered nice paddling. The Alpinsprint section of the Sesia was at a good level and plenty of fun too! When I first heard this I was a little bit sceptical – for sure I’ve heard of rivers in the Atlas that can be paddled, but to be honest I had no real idea about the area. So when we had the chance to team up with Txus from Urnomade, it was kind of quick decision. He has profund knowledge about probably most of the rivers. First we spent one week in the Melloul and Ahanesal area and made the classic runs, which are mostly moderate and medium volume class 3 to 4+ in an absolutely stunning scenery. Instead of the expected deserted valleys we found forested hills, green meadows and canyons that almost bring up Grand Canyon feelings. 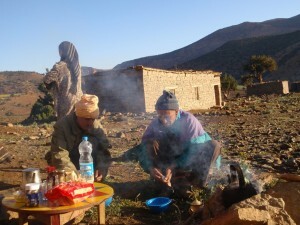 And not to forget the very friendly local people where hospitality is still written in capitals. 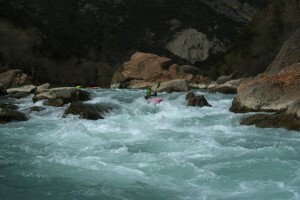 For the second week we were just four kayakers left: the two basq guys Txus and Ramon, and the two of us. 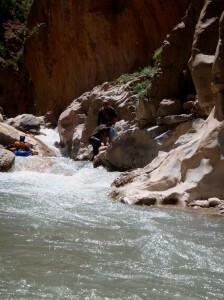 Due to low to moderate levels of the Melloul Txus brought up the idea to make an attempt on the Aka Tiflout (a tributary to the Melloul), whose lower section had been paddled before, but whose upper canyon seemed still undone. So why not? Early in the morning we set off for the hike in: two mulesmen, two mules carrying the kayaks, the four of us and Txus local friend and mountainguide Mostapha. What had been reported a 3-hrs-up and 1-hour-down hike, turned out to be an almost 7-hrs-up hike, so we decided to stay in the small village and go for the river the other day.… bereber and continental time do not always the same … but we had a nice place and enough food to stay for the night. 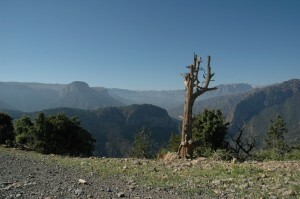 The next day we took an early start – as we had no idea about the exact length of the gorge. 1-hour-down was 1-hour-down and soon we found ourselves at the top end of the canyon. For the first two kilometers the river meandered through his gravelbed with a few sparse rapids, but the high hills on both sides told us, there was more to come. 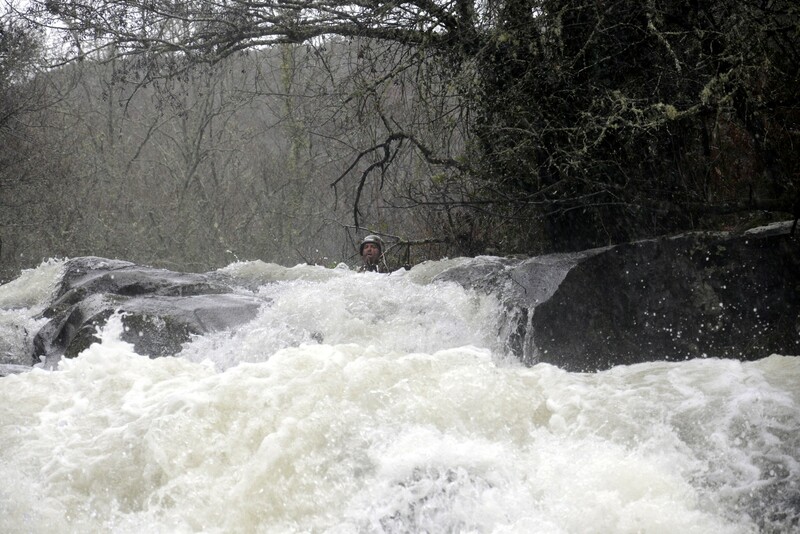 After this section the walls started to rise and tighten, with more rapids coming up. 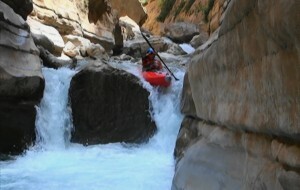 Then we entered the box canyon and things started to get more challenging. So we were lucky with the levels, which first we thought to be a little low. For the next 2 kilometres the Aka Tiflout flows through a deeply carved canyon with lot of bedrock rapids and of course some portages. 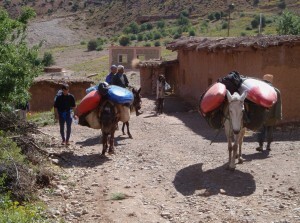 After the box canyon the river camls down a little and 5 hours later we arrived at the confluence with the Melloul and cruised down the last few kilometres to Anergui where a big plate of cous-cous was waiting for the hungry crew. Site Admin | Free WordPress ThemeBlanca Nieve’s kayaking blog Copyright © 2019 All Rights Reserved. Bad Behavior has blocked 7 access attempts in the last 7 days.